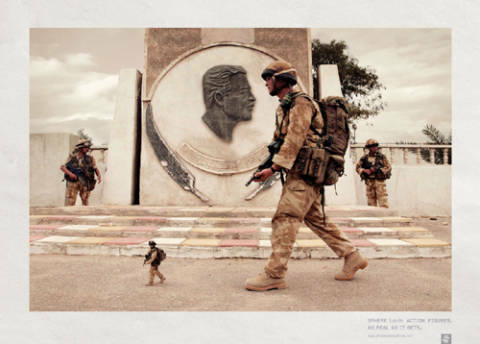 Sphere Action Figures in 2004 were promoted in an award-winning print advertising campaign based in Singapore, drawing inspiration from coverage of the war in Iraq. 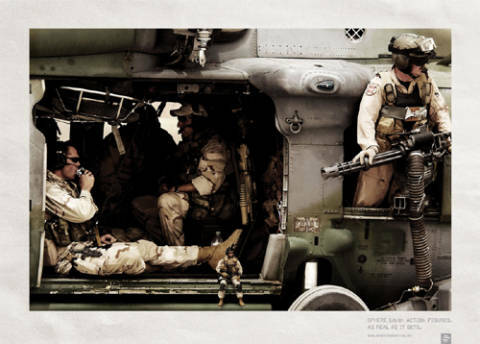 Actual size action figures were embedded in photographs of real-life soldiers to present the tagline: “As Real As It Gets”. The 16 Air Assault Brigade 24 was formed as a unit of the British Army in 1999 through the merging of the Airmobile Brigade and elements of 5th Airborne Brigade. 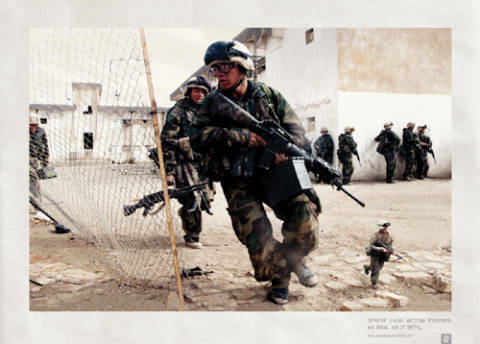 The 7th Marine Regiment is an infantry regiment of the United States Marine Corps based at Marine Corps Air Ground Combat Center, Twentynine Palms, California. The Desert Rats are the 7th Armoured Brigade of the British Army, the successor of the 7th Armoured Division whose exploits were legendary during World War II. Pararescuemen (PJs) are United States Air Force Special Operations Command and Air Combat Command operatives tasked with recovery and medical treatment of personnel in humanitarian and combat environments. The campaign was developed at TBWA\Singapore by creative director/art director Mark Bamfield, art director Marcus Rebeschini, copywriters Robert Kleman and John Sheterline, account supervisor Johnson Tan, advertiser’s supervisor Terence Hoi, and features the photography of Lai Choon How and Jarvis Lim (Groovy). The campaign won gold at Cannes 2004, won gold and bronze awards along with best of Print, best photography at AP AdFest, and gold at The One Show 2004.